An easy to use and approachable tool to aid in the transition from formal employment to a meaningful retirement lifestyle. Forty-eight common pastimes - from cultural events to meditation, from entertaining to group leadership - are listed and described. Cards can be used to determine current frequency as well as preferred activity patterns. 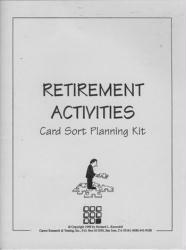 The manual provides explicit instructions for using the card sort, an overview of the concepts and issues of retiring, summary and worksheets for processing the exercises and eight supplementary activities for dealing with aging and retirement. A useful resource for organizational pre-retirement programs.